What is a Postage Meter? A wide range of media capabilities, including up to 52″ banners and a variety of heavy paper stock to keep more of your daily printing in-house. The fast and reliable C532dn color printer, with OKI LED technology and a powerful new engine, is built to support small workgroups and businesses that require expanded performance with excellent HD color output and security. The C532dn will handle the workload of busy offices, with the flexibility to print on heavier and larger stocks including 52” banners, and scalable paper capacity up to 1,410 sheets. Safe and secure mobile connectivity ensures your C532dn is equipped to support mobile print demands in today’s ultra-connected workplace. Right out of the box, your C532dn is ready to produce vivid in-house marketing collateral and business documents – a cost-effective alternative to outsourcing print jobs. 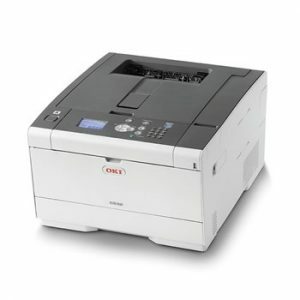 With fewer moving parts than a traditional laser printer, OKI’s LED print engines are built to last. This reliable foundation ensures a quality return on your investment, while Toner Save, Deep Sleep, and Auto-Off modes help conserve energy and lower consumable costs. Moreover, OKI’s LED printheads allow for automatic duplex printing, reducing waste and saving money. The C532dn is designed to make mobile and network connectivity safe and easy. The machine is compatible with Google Cloud Print 2.0™ and Apple AirPrint™ for stress-free mobile printing, while simple direct printing is available using local mode. When simultaneous wired and wireless networking is necessary, Wireless Direct offers seamless and secure connections. The C532dn’s Gigabit Ethernet swiftly transfers large color files across networks to meet the tight deadlines and increased demand that accompany business growth. Now more than ever, it’s imperative that your cloud-connected device’s security features are current and competent. That’s why the C532dn is Internet Protocol Security-compliant (IPSec), ensuring documents are safely sent and received. A Private Print encryption function keeps sensitive documents confidential, while an optional Card Release requires user identification at the printer to prevent unauthorized print jobs.